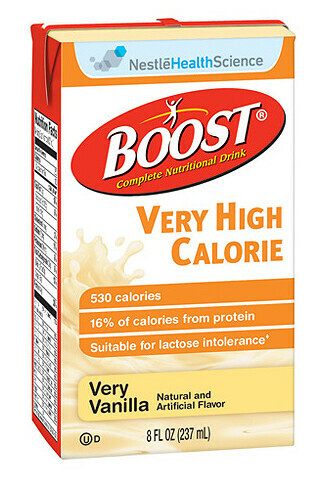 provides 170 more calories and 8 more grams of protein than Boost Plus Nutritional Drink in the same 8–ounce serving size. Contains 22 grams of high–quality protein to help build muscles and skin. Refrigerate after opening and use within 48 hours. **Important Notes: As with all medication taken with food, drug/nutrient interactions should be evaluated by the physican and/or pharmacist prior to use. Product nutrient values and ingredients are subject to change. Please see product label for most current information.